Well, shucks. I’m sitting here, in my bed, face mask on, and sweeping the tears from eyes. Not tears from a boy. Nor from a particularly gripping episode of This Is Us. Wait a minute, I thought. THAT’S MY BOOK! My interest was obviously piqued, and I spent the next few minutes, pouring over Arabella’s heartwarming, vulnerable, – and exquisitely written – review of my book, Bloom. And as the tears rolled down my cheeks, I had to get up, grab my laptop, and write this post. I want to start out by thanking Arabella for such a raw and honest review of my book. I am so incredibly touched that my book played a role in your recovery. And I am cheering for you, and the abundant life of freedom you’ve found with Christ in recovery. God is most certainly good. As I sit here, on my third Kleenex, I had to stop and examine where this swell of emotion was coming from. Yes, clearly, I was touched by her review. But more than that, THIS was precisely why I wrote the book. This is the very reason why I chose to put my brokenness and wounds on display. And in fact, as I was writing it, I was picturing in my head – and praying for – someone just like Arabella, picking up the book and a pen, and working through her recovery, one day at a time, just like I did at inpatient treatment. That was my deepest prayer: that my story would help a young warrior embrace recovery and find freedom. That by sharing my wounds, I could help someone feel not alone in their suffering, but empowered to find healing with Christ. When I started this blog, back three years ago now — which is crazy to think about — I was so scared to share the story of my brokenness. I was terrified to expose the unfiltered, uncensored, truth of my past because it wasn’t pretty. I spent those years, destroying my body, and wasting away, not only physically, but mentally, emotionally, and spiritually too. And all the while severely damaging all the relationships in my life. At 78 pounds, my body was evidence of a desperate cry for help, and yet I ferociously kept the world at arms length, through anger, manipulation and isolation. I carried around so much shame and guilt from those years trapped in my anorexia, and sharing it with the internet on a blog – let alone a book – seemed like the most frightening idea ever. Which is precisely why I knew that I must do it. I must share, in the chance that someone else in their suffering, might find, not only compassion and companionship, but the the strength to heal. After Jesus died and was resurrected, He led his ministry with His wounds. He went to Thomas and showed him the scars on His hands and side, and said, “Put your finger here; see my hands.” Jn 20:27 He led with them. He wasn’t ashamed or afraid. He led with them, because they showed His love. They showed God’s redemption and victory. His scars were glorious. Glorious to the power of God, and His strength to overcome. And as we are to follow in Christ’s perfect example, I knew that it was my job to share my scars, too. Even single one of us has a story to tell. One of hope, redemption, and victory, whether we know it yet or not. But God knows. God is working, and visible every step of the way, only sometimes we don’t realize it yet until we are on the other side of that season of trial. But it is in sharing our stories, that allows the glory of God to be magnified in our lives. Showing how God can take the broken and make it beautiful. How God is Rescuer. Healer. Redeemer. That is written in our scars. So Arabella, thank you, for having the courage to share your story, and for allowing my book to play a small role in that. You are a warrior, and I am inspired by your courage to reclaim the life that Jesus won for you. I invite you to take a few minutes to go read her blog post. I hope that it moves you the way it did me. And this week, I challenge you to share your scars with the world. Because you, friend, have a story that is worth telling. Believe that. I, for one, would love to hear it. And if you’d like to order my book, you can do so by clicking here. And HEY! Are you signed up for my free newsletter? Not only will you get my posts and recipes delivered straight to your inbox, but you’ll also receive my daily morning videos! I’ve been getting such great feedback on them! Let’s grow in friendship together! Congratulations on your discovery of a reader in whose life your book has made a difference! And for each one you discover, I’m sure there are dozens more whose lives have been changed but who never write about it or, if they do, you never learn about. To be honest, I’m sort of envious in that I can’t say (to my knowledge, anyway) that of any of my own books. Granted, they are of a different nature, but. . . . We persevere in our calling regardless of whether we know of the impact because that’s what we’re called to do. As Thomas “Stonewall” Jackson famously said, “Duty is ours; consequences [results] are God’s.” Keep sharing and helping others–even if you don’t hear about how they’re helped. 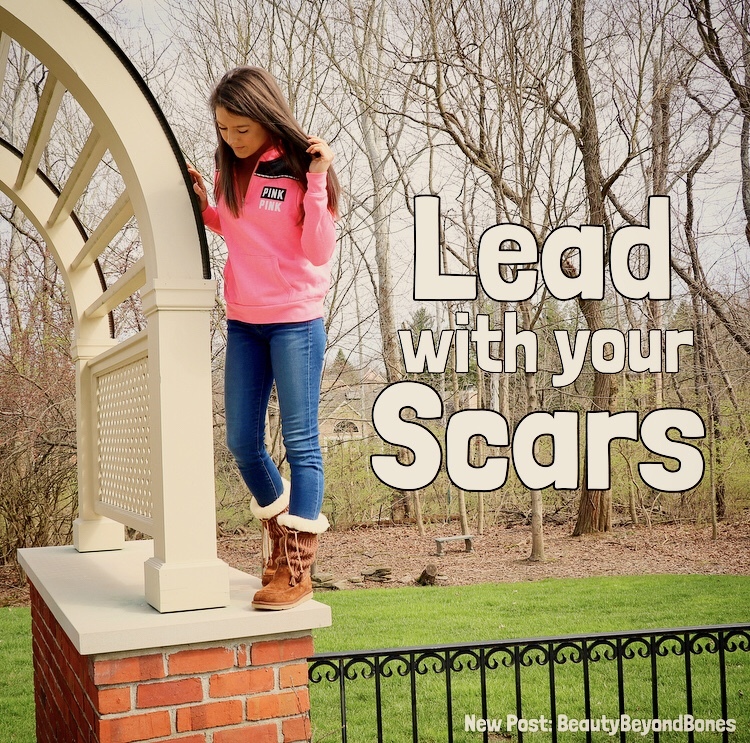 Absolutely love that phrase, “Lead with your scars!” Just like Jesus! Going to steal that for a sermon. Magnificent. This is wonderful, truly wonderful in a most beautiful way. And…I guess I’ve been under a rock, no a planet, because I just discovered that you have a YouTube channel. You are such a joy! That is really cool, praise God! It is awesome how He works in people’s lives! God bless you sister! I have always found this to be true! Every time I’m hesitant to share because I know it means I have to be open and vulnerable, God uses it in ways I could never have imagined! And I am always encouraged when others are open as well. Thank you for your honesty on here- it reminds me to do the same! I love to see How God is using you and your writing to help others. I minister a lot to the great people in our local recovery community. I will get a copy of your book soon. Keep being the light you are. I just started blogging again last week after a few years away. College, ministry and life got busy for me. I’m so happy I found your blog. Great work, sister! I began leading and ministering with my scars in 2012. When I had no clue what anxiety was when it hit me unexpectedly, I thought I was experiencing something that would no longer allow me to publicly minister. Through medication, my anxiety and depression was controlled. Then divorce hit (which is a long story in itself), but God expanded my ministry because of the scars. Our difficulties are tools than are not meant to be wasted. Very well written, as always. I’m trying to show my vulnerability more. Now there you go being a great inspiration to somebody. You are going to inspire many people, and getting people to embrace freedom is something we need today. They will see that you a gorgeous beyond bones. Aw, you are very graciously welcome. It is YOU who is the encourager, and you are going to mean so much to many people. Hugs and love back. Back to you, and I hope that you had a great Veterans Day. I did. I saw boy scout set flags in honor of vets at the Veterans Museum in Beckley, West Virginia. Wow! That’s incredible to see the power of your message helping others. You are right – there is tremendous power sharing your story with vulnerability. Interesting how you made that spiritual connection. Jesus was born in circumstances only the poor would understand, similarly he suffered hunger, thirst and the whole range of trials and tribulations the human race has to put up with under the cruel usurped rule of satan. He endured the cruellest physical and mental treatment at the end. He did it for us as an example. You have caught a reflection of that reaching out to a specific group of sufferers through your book just as the Gospels reach out to all of us. I believe you were prompted to do that under direction of the Holy Spirit. Continue to listen to His voice as He has obviously chosen you to model the empathy of Jesus and show that He can make miraculous changes in anyone’s life. Beautifully written! Love the title. Sharing our wounds and suffering is difficult. But there is also fellowship with Christ in those places, if we let Him and others in. Thank you for sharing! Love the connection you made with Jesus’ own scars. I hadn’t heard that one before! Thank you for always including the Gospel on your blog… it is always powerful. Inspired by being an inspiration. This is a good start for my day. thank you. Wow! This is exactly why I share my scars too. Jesus did not come to be served but to serve. Since I started blogging I’ve had so much support from this community and it makes me want to pour out more inspiration and encouragement on to people. We all need to share our stories because our messess are messages. Thank you som much! That’s one you’ve heard about. I’ll bet there are thousands who have been helped by your book and blog! God has blessed your work! Thank you for your post; it is so very uplifting to see that the Lord is able to use what we do to make a difference in the lives of others. Over the last few months, that’s something I’ve been struggling with, being able to be salt and light that builds up other people without simply adding to the noise. Keep up the good work. God loves you and through Him you have what it takes! This is a wonderful report and awesome reflection. Christ has given you such a share in his work through your writing. As I heard someone say, “Your mess becomes your message.” So true! We just have to risk the vulnerability it takes to share our messes. Have you read Henri Nouwen’s Wounded Healer? Do you think your Bloom story would help my kid with anxiety and addiction? My healing can only come from God. My spirit needed healing, not just my mind and body. Thanks for sharing your story. How has having a blog helped in your healing? Great post! Some of us live with ongoing scars, or in my case, a life of constant pain, living indoors, much of the time in bed, but not really much of a story to tell. But it truly is Jesus that gives the strength for each day so that we can enjoy the many blessings He gives, no matter what we go through. Keep it up! Steve. Thanks BBB! Your prayers are welcome indeed. I am enjoying your blog and your video from Nov.12 was a real blessing to me. Keep it up! I’m just so scared to share my story still. My family is not talking to me. This Trauma. What you said about Jesus, I know it’s what I’m meant to hear. I know its what he wanted me to know. Marsha. No matter how dark it seems you are never alone.. it may be challenging right now but take it from somebody who hit rock bottom. IT CAN AND WILL GET BETTER. Your family are probably struggling to find the way in their heart to have that discussion with you. Trust me, when they are ready Love will show them the way. I hope you find the strength you need. Praising Jesus with you, Caralyn. Your Beauty, Sweetness, Humbleness, is only surpassed by your Love for our Saviour and Lord, Jesus Christ. Scripture tells us that we are only able to Love God, because He first loved us. That love was shown on Calvary. Caralyn, when you died to self, you began to truly live in Christ, by faith in Christ, because of what He did, as I know you know. Also, at the same time, you died to the law, with the result of belonging to God, so you may bear fruit for God, our Heavenly Father, which you are doing. You continually plant seeds, water the soil, till the earth, and God dies the harvesting. Even though we are the cause of our own suffering, God never gives up, and when we turn to Him, He will work in us, and through us, ministering to others who are suffering, to comfort them in the same way He called and comforted us by His Holy Spirit. In your obedience, Caralyn, Holy Spirit has touched, and will continue to touch many more, because you put Jesus Christ, and others before yourself, being vulnerable and open, putting your “scars” out for any and all to see. Our wounds and scars, battles won and lost and our entire testimony must uplift and encourage others, if not they were wasted experiences . . . and that is what you have graciously done with your story, sis, encourage and uplift others, letting them know that they can win, no matter how many losses after… Here’s a pat on your back. Oh my heavens, how absolutely wonderful, and this all resonates so deeply with me! Leading with my scars is exactly what I want to do now … It’s precisely what I’m called to do, unashamedly, for the rest of my God-given time in this world. Thank you so much for this, and may God continue to bless you, and may God bless Arabella! Such an amazing insight. I’ve often felt a bit embarrassed being transparent about my own mental health related events but for the same reasons as you described above, it is the right thing as it helps normalize an experience for someone and let’s them know they’re not alone! They’re not God forsaken either because he isn’t an absentee landlord. He stepped into it all with us. Thank you for putting yourself out there and leading with your scars! To God be the Glory! Great thoughts. You’re terrific. This probably works more easily for women than men, and most men I know have no desire to go into the subject of feelings or emotional scars or anything beyond what was on TV last night. But it’s definitely good to not attempt to hide weaknesses and hurts in an effort to appear “normal”. Wear it with honesty and look for opportunities to encourage others. Scars are evidence of battles won, because they show that we have survived to heal. Real warriors bear them proudly. Thank you for telling the story of yours, like Christ’s they do indeed give us hope that tomorrow is a new day and the weapons of the enemy cannot destroy those who trust the healer. I love that concept, “lead with your scars as Jesus did” I’ve never heard it put like that before. Most welcome hun!!! Right back at you. Continuous proof that there is power in your testimony!!! Still yet!! Beautiful! May God use all of us to do impact change! Wonderful! Yes, you have touched many by your blog and you are doing just what God wants you do. I am not surprised. How could someone read something from you and not be touched and feel transformed? Your blog was one of the main factors why I chose recovery. And Bloom was incredibly helpful, many days I ended up in tears reading it because the Scripture and your reflection about it were just too overwhelming, but in the good sense, overflowing with grace. Wonderful words. Stay blessed and continue to spread your words that are placed on your heart. I became determined to share my journey because it is my duty, my responsibility to do so. If I can reach just one person by sharing my issues. If I can provide that support needed to stop someone from making the same choices I did when I reached my low point. If I can provide hope to somebody by making them feel less alone, then I should do so. I had support although I didnt realise it until too late. Yes I had to reach rock bottom before I realised this, but if I can help somebody realise this before it gets bad. Like you say, lead with your scars, whether they are mental or physical. By sharing your journey and recovery you became a hero, a beacon of light in somebody’s dark times. By showing that no matter how bad it seems there is light at the end of the tunnel. No thank you. You are the hero that inspired me to share my journey. You have helped many by sharing your journey. Myself included. I feel oblidged to pay it forward and YOU gave me the strength to do so. Anybody I help you can indirectly (at least ) take credit for. You are an inspiration and yes a hero. I love the way you are always so accesible in your writing. I appreciate your bravery in sharing your experiences. Truly inspiring! Love this. So glad that you found the courage to share, sister. Whoops, I wanted to mention that I am “pressing” this today…. Oh gotcha! Haha thank you!! !